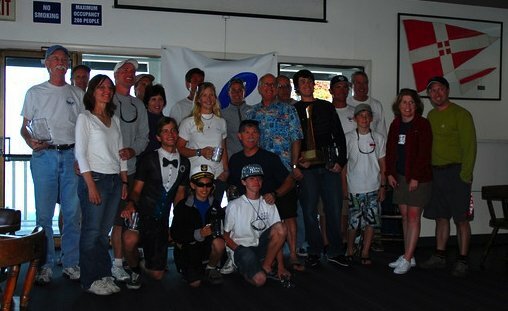 Saturday, April 19th was the big day in which 12 teams showed up for the Lido 14 Fleet 6 Championships. We had both an A and B fleet out on the water with both classes starting together. The racing was intense, especially in the top of the A fleet. The wind started out around 10 knots from the south-west, but by the last race it had shifted to the south and became rather fluky. After several races, it was easy to see that two teams had a chance of taking home the top prize: Mark & Sarah Ryan and Freddie & Fred Stevens. Both had several tacking duels throughout the day (and several run-ins!). At the end of the day, both teams were tied each with two firsts, two seconds, and one third, with the Stevens winning the tie breaker. My congrats goes out to them. Coming in third was Grant & Connor Hill. They pulled off a bullet in the second race! Following team Hill by one point was Ross Nemeroff & Rob Rice. Coming up in fifth was our Fleet Captain Don Taugher with crew Chris Taugher. Within the B fleet, long time Lido sailor Tracy Conn & Mark Stanifor pulled out a victory. Two points behind him was John Hauk/Steven Hopkins followed closely by Jim Drury & Bruce Wasson. It was great to see Bob & Edna Best out racing in their new lido 14 #6307. Although they didn't finish in the top, they persisted for the entire regatta and never gave up. That's the true spirit of lido sailing and we look forward to seeing them out in our upcoming twilight series! A Big thanks goes out to Marc Schryer and Rob Rice for running the regatta. Captain Rob also took some sweet photos of the races, too. You can view them on the Fleet 6 page on the ABYC website(www.abyc.org -> Fleets -> Lido Fleet 6 -> Photo Album). Also, a Big thanks to Jon Robinson for setting the marks and being the whaler dude. Smooth Lido 14 sailing everyone! Ross Nemeroff & Rob Rice Jr.